Our Rates Include: NO HIDDEN COSTS! Proudly Serving Over 115 Cities and Surrounding Areas In Ontario, Canada. Are you getting attitude with your current process serving company? Call us, we can help. Tired of sending your important documents to a P.O. box and not sure who is serving your documents? We can help! Don't be fooled with low cost gimmicks to find out your invoice is 300% more with hidden costs and disbursements. WE WILL HELP your company in the Service of Process. See why our company is First Class! 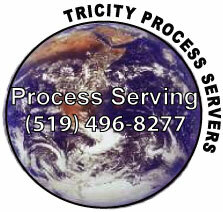 Ontario process serving offered.